The latest episode of Ocean’s radio show included a new version of Ocean’s “Slide On Me” featuring Young Thug. Early Monday morning, April 24, the fifth episode of Frank Ocean's Beats 1 show blonded RADIO aired. Hosted by regular hosts Roof Access and Vegyn, the episode included music from Arthur Russell, Kanye West, Guided By Voices, Four Tet, The Floaters, and more. 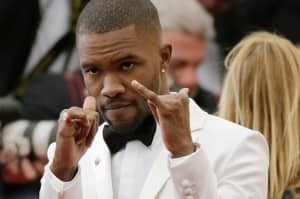 The episode also included the premiere of a new version of Frank Ocean song “Slide On Me,” featuring Young Thug. The original "Slide On Me" appeared on 2016 visual album, Endless. Listen to the fifth episode of blonded Radio here, and peep the tracklist below. Darondo - "Let My People Go"
Gerry Rafferty - "Right Down The Line"
Four Tet - "My Angel Rocks Back And Forth"
Mulatu Astatke - "Yegele Tezeta / Yekatit"
Holy Ghost - "Some Children"
B. B. & Q. Band - "On The Beat"
The Noveltones - "Left Bank Two"
Karriem Riggins - "Bahia Dreamin'"
Kanye West - "Everything I Am"
D'Angelo - "Send It On"
Marvin Gaye - "Is That Enough"
Patrice Rushen - "Remind Me"
Frank Ocean - "Pretty Sweet"
Guided By Voices - "Chicken Blows"
Grandaddy - "Collective Dreamwish of Upperclass Elegance"
Arthur Russell - "Place I Know/ Kid Like You"
John Mayer - "You're Gonna Live Forever In Me"
Trust Fund - "Would That Be An Adventure?" Tashaki Miyaki - "Get It Right"
Sébastien Tellier - "La Ritournelle"